Tony Rebel, the conceptualiser and engine behind Rebel Salute, which (in case you missed it) was named in his honour. 1. It is all about Tony Rebel. Rebel Salute is the brainchild of renowned reggae artiste, Tony Rebel (birth name Patrick George Anthony Barrett). It is held on or around January 15, which is Tony Rebel’s birthday. 2. They use artistes’ proper names. 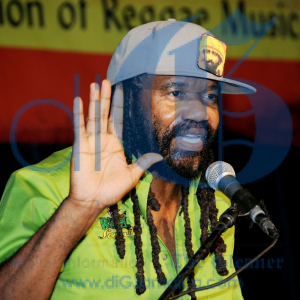 Rebel Salute is all about conscious music. Even when dancehall artistes are billed to perform, this is usually done under their proper names instead of their stage names, to give them a chance to show their ‘good’ side (according to Tony Rebel). So ‘Lady Saw’ becomes Marion Hall, and Beenie Man becomes Moses Davis. 3. No alcohol, meat, drugs or weapons. As part of the push for consciousness and livity, Rebel Salute has and enforces very strict rules about what patrons can and cannot bring to the venue. Absolutely no alcohol is allowed. No drugs. No meat (part of the Rastaman’s livity). And no weapons (because we come to appreci-LOVE the music, not to appreci-HATE each other). 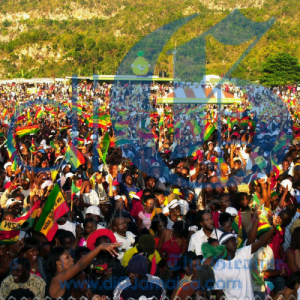 This is a result of the mix of Rasta culture and Jamaican stageshow culture. When music sweet yuh (when the music becomes sweet to you or makes you feel sweet), you will have to grab something and wave. 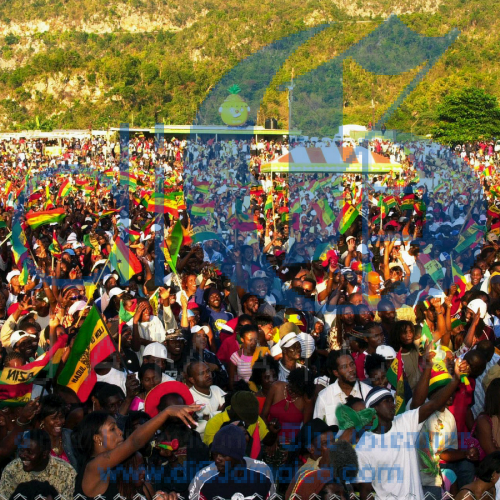 Otherwise, you will see authentic Rastafarian flag men waving their ital colours all night long. Yes. Real Saluters know that there will be chanting. This is the natural outcome of a group of culture-conscious Rastafarians gathering in one place. They will chant something at some point in time, or several things at several points in time. 6. Something must get bun’ out. Whether it be Babylon, ‘di system’, the po-po, oppression, poverty, the devil … something will get ‘bun out’ at Rebel Salute. ‘Bun out’ is a Jamaican patois for ‘burnt out’. In this case, the expression refers to the (purely metaphoric) application of Jah’s holy fire to all impurities and unjust ways of being. Rasta colours – red, yellow, green – always a staple at Rebel Salute. 7. Red, yellow and green are most appropriate. This is not a law, but it is kind of like an unspoken rule. Because so many Rastafarians attend Rebel Salute annually, real Saluters know to expect to see these colours all night long. It is the Rastaman’s colours of choice, and this will be evident everywhere. 8. It’s an all-day, all-night affair. Rebel Salute is not for the faint of heart. It offers non-stop music from dusk till dawn. Real Saluters know that and prepare for it. So they walk with a blanket, or portable chairs, in case they need to sit down. They have already scouted out where they will source food or water from, or save themselves the expense by bringing their own. And when they get to the venue, they know that they have to find a spot that will work for both the jiving to the music and the rest periods in between. Directly related to the point above. Because the grounds are mainly grassy, and you will be standing for so long, real Saluters know better than to pull out their spike heels for this event. Especially the ladies. They know that Rebel Salute is about the movement to the music and they dress accordingly. 10. Bring/Wear something to keep you warm. Because the latest venue for Rebel Salute is by the beach, and there comes an hour when the sea breeze starts to rip through your clothes and deliver a different kind of chills. Be ready. Bring a jacket. Wear comfortable, warm clothing. Real Saluters know this. Check out our article on 10+ Cool Things To Look Out For At Rebel Salute.